This 204 page hardcover volume collects the first six months of Craghead's daily drawings, each accompanied by a Trump quote and/or with context and commentary from that date (all of which are sourced in the notes), beginning with the day when Trump accepted the Republican nomination for president on July 21, 2016 and ending with the day of his inauguration on January 20, 2017. "Every day, Warren Craghead draws and shares grotesque portraits of Donald Trump and his minions. 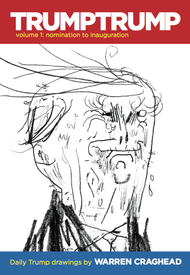 TRUMPTRUMP Volume 1 collects the first six months of these daily drawings with context and commentary, from when Trump accepted the Republican nomination for president on July 21, 2016 until his inauguration on January 20, 2017.